Have you counted how many days are left until Christmas? If you're counting down to Hanukkah there are even fewer spots to mark! How did this happen?! I'm not ready for either of them!! Luckily, Girl Friday Virginia has a couple of fantastic ideas that I fully intend to borrow to get us through the holiday season with lots of ideas at the ready. Ok, check this out...she turned Bubble Box Fri-Dies into tags! She used Pinecones in traditional green ink, and also white (snowy) ink! Then she added the lovely Snowflake Splendor sentiments in red at the bottom. All they need is to and from on the back and these darlings are package ready!! Hello beautiful Flurry Fri-Dies in glitter paper! 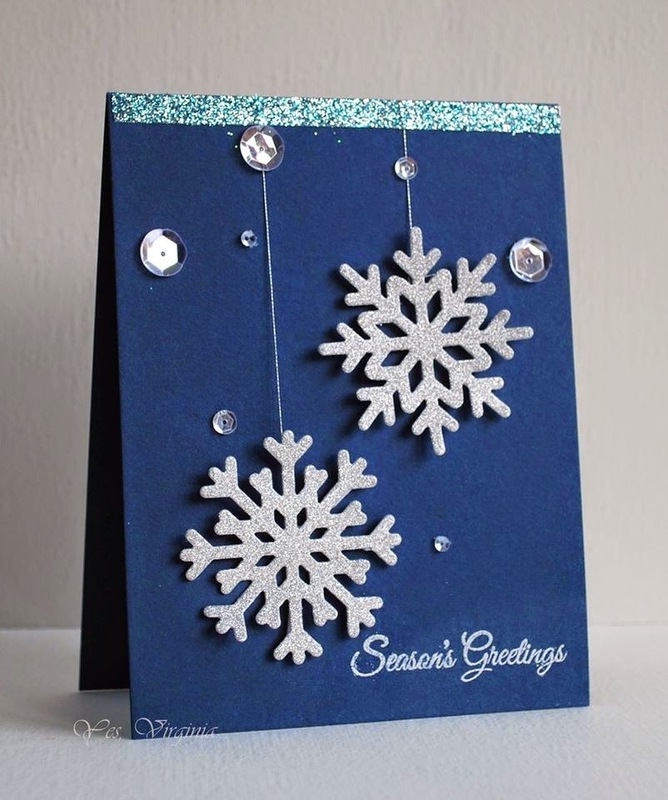 A little bit of pretty string and a couple of shiny sequins, and this card is ready to dazzle! right after I finish hyperventilating into a paper bag because I haven't started my shopping yet!! Virginia......you shine, card and tags are wonderful. Thanks so much for stopping by, Harriet! Your comment makes me smile! Absolutely love these! CAS & beautiful! These are beautiful. I love the designs and colors. Thank you for the sweet comment, Sheila! I love how you stamped the Pinecones on your tags and your card is just beautiful, Virginia! All that sparkly goodness on the dark blue panel is so pretty! It's always a JOY to have you stop by, Barb! LOVE Virginia's work...awesome tags..love the pops of white! The card? Seriously love. These are soooo pretty!!! Love them, Virginia! Virginia is amazing.. i love those adorable tags and that card is just perfect.. 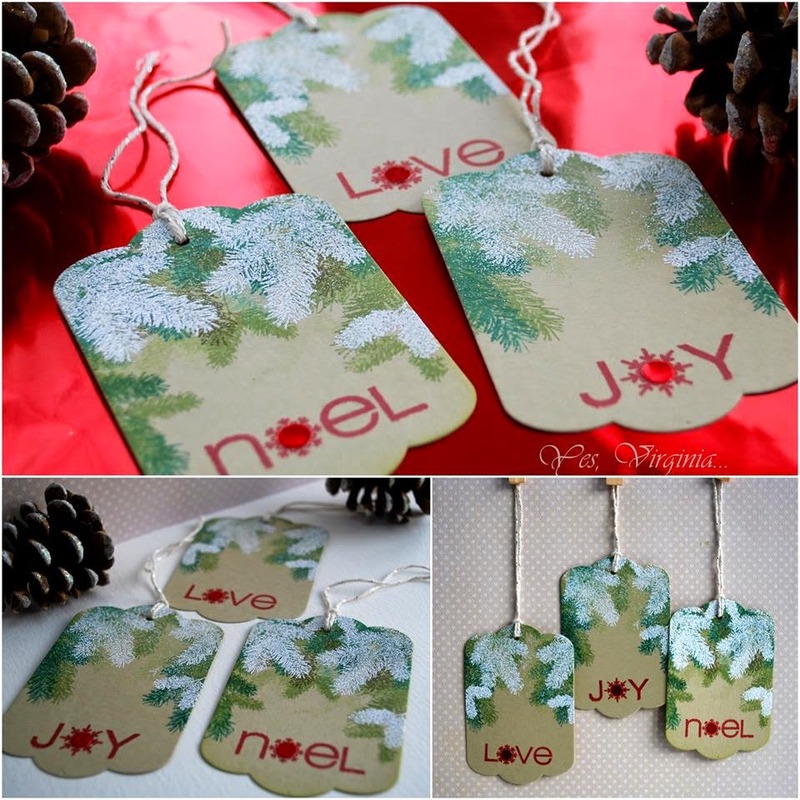 Wonderful tags, and I love the snowflakes against the blue background! Thanks for sharing your BEAUTIFUL tags.